Often described as the “scourge of the century”, back pains and related disorders have always frustrated patients and kept doctors in dilemma with regards to providing a remedy. With the advancement of technology and kinetic treatment a ray of hope has emerged for those suffering from it. To enable local citizens to have recourse to such treatment, KKT international opened a clinic in Phoenix. 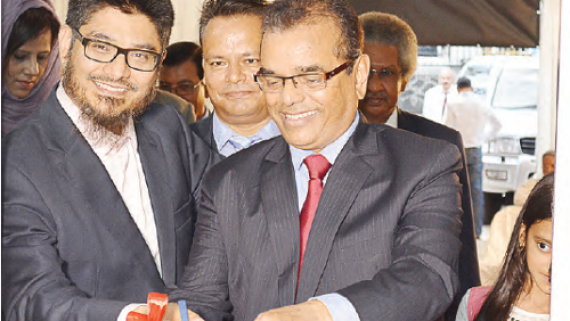 The launching ceremony took place on August 26th in the presence of Ministers Suren Dayal and Cader Sayed-Hossen. The KKT Orthopaedic Spine Centre proposes the Khan Kinetic Treatment (KKT), which makes use of special machines that allow to realign the spine and delay its aging, as well as to bet-ter position intervertebral discs. The treatment, developed by Dr Aslam Khan, will be provided in Mauritius by Dr Reebye. “This treatment does not imply surgery or injection. It is painless and non-invasive,” pointed out Dr Reebye on the occasion. Dr Reebye added that the KKT treatment comprises 12 sessions of 15 minutes each. “We send them x-ray reports that they analyse before commending any kind of treatment. It is at the level of the Canadian KKT Orthopaedic Spine Centre that the number of sessions that will be required for a patient is decided,” underlined the doctor. He also stated that the clinic would soon embark on organising outreach programs throughout the island.